Zeruel is similar in appearance to Shamshel, but more so also in weaponry. Instead, however, of two laser-like tentacles, they're super sharp flexible razor blades. Able to make a clean cut through anything, it can be very destructible. Also, it can produce a very devastating energy blast can be shot in volleys. Plus it is very agile and has a strong AT field. Zeruel eliminates the Eva pilots rather easily until Shinji decides to join in after Asuka and Rei fall. 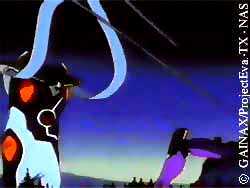 Shinji, in a fit of rage, almost destroys Zeruel until he loses power. Almost close to death, Unit 01 reactivates without any power and begins to destroy the Angel, even to go as far as eating the Angel.